Hooray- better late than never! This week's Iron Craft challenge was to make a 'door snake' or 'draft dodger' ...our house is so cold and we only have one door! So I decided to make a different kind of snake for my best friend's new baby boy. 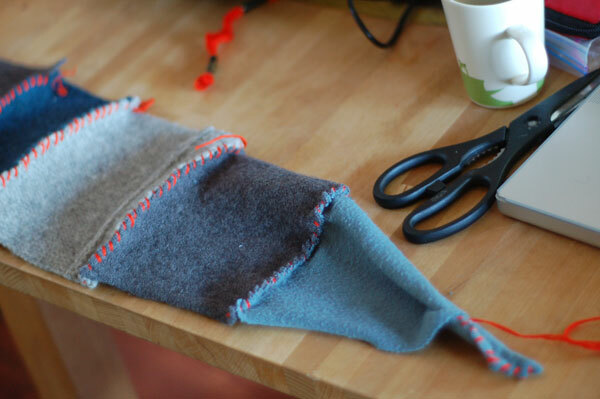 I had some sweater pieces leftover from a blanket I made for my son (awesome blog post here). I'm so glad I kept those few extra pieces. It's a little funny looking the way it's snout scoops up, but can we just say that it adds character, ok? Here are a few pics, beginning, middle, and end. Cheers, crafters! Next week's challenge is bunting. Yay! !